My Musicnotes Player says the Musicnotes font is unavailable; the clefs and note heads look like letters. How do I get additional transpositions of my piece into the Musicnotes Player? How do I set or change the Save Folder Location for the Musicnotes Player? How do I select a passage of music in the Musicnotes Player so I can listen to it over and over? How do I get the Free Songs for the Musicnotes Player? Can I choose my own free titles? How do I download & install the Musicnotes Player? What is the Musicnotes Player and why do I want it? To view playback for the additional keys that your title is available in, open the Musicnotes Player. When the Sheet Music Manager screen appears, login if prompted. 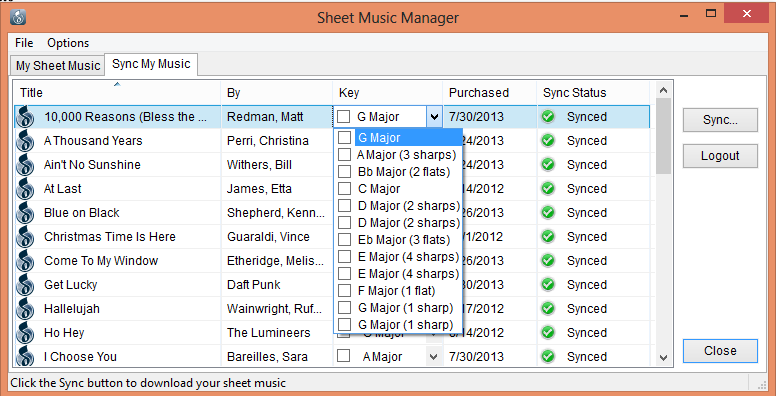 You may also click on "Options" from within the Sheet Music Manager window and put a check by "Include All Transpositions with Sync" to ensure future downloads automatically sync all keys, and not just your purchased key.